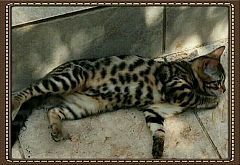 The Bengal cat breed originates in USA. In 1963 Jean Sudgen bought a female Asian Leopard Cat from a pet shop. A leopard cat is a small wild cat with a long body - much smaller than a leopard. This shy wild cat is an endangered species. She put a black domestic cat in the cage for company. The animals mated & produced two kittens, a male & a female. The male was killed by the wild cat, but the female kitten was saved. She was spotted, like a leopard. 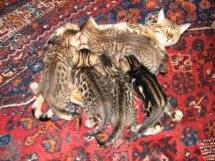 The kitten was mated back to the father, producing more spotted kittens. Later, Jean contacted geneticist Dr Centerwall who was working on a breeding programme which involved crossing Leopard Cats with domestic cats to study Feline Leukaemia. Jean obtained several hybrids from this programme. The Asian leopard cat, felis bengalensis (where the Bengal name originates) is found in India, China and the Soviet far east. Also, in the Phillipines, Sumatra and other islands. 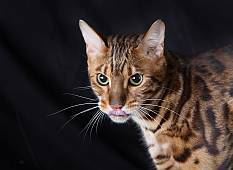 They were crossed with Abyssinians, ocicats and Egyptian maus. Domestic pets have to be at least 4 generations removed from the original wild parent. They are classed as a Bengal, not a leopard cat hybrid. 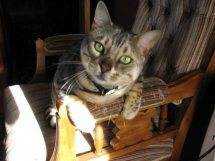 The playful, affectionate Bengal cat gets along fine with people, children and even dogs! Some like to play with, or in, water. They liven up even more at night, as a wild cat would. Bengal cats have the looks of a wild cat, but the nature of a sociable domestic cat. Ochre-yellow to brownish, or yellowish-grey background. They have a ringed or spotted tail, with black tip. Four black bands run from the back of the neck to the forehead. Oblong spots on the shoulders and neck form a “broken necklace”. White is seen on the underside, throat and cheek-flashes and “ocelli” – a white spot found on the back of their round, black ears. Body markings can either be solid or rosetted, or marbled and underparts appear spotted on a light background. Eyes are oval, slightly slanted towards the base of the ear. Tail is thick & carried low. By selective breeding, man can change the appearance of a cat. But can a leopard change his own spots? We're all leopardettes at heart - the wild cat within us surfaces as killer rage, or as a desire to creep about at night when no one sees what we are up to. To improve domestic relationships, we need to change our wild ways. If we are sorry, we can start over as new "cool" cats! "If any man be in Christ, he is a new creature, as God reconciles us to himself through Christ." 1 Corinthians 5. 17.